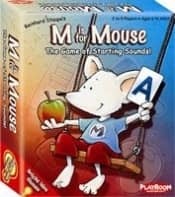 M is for Mouse is the letter-learning game that's fun for everyone! A is for Apple, and B is for Banana! Each object forms a match with its first letter, and players must try to quickly find all of the pairs they can. But there is a catch: every time you form a pair, either the letter or object gets covered up, and cannot be used again! Can you spot the most before they all get covered? Players can enjoy M is for Mouse with 3 different levels of play! Contents: 5 Reference Boards, 26 Cards, 30 Chips and Instructions in English, Spanish & French.